You know what you are getting when you invite people to your house? And unexpected rezeki I must say. It happened to me a lot. That's why, organizing my own open house has been on top of the list when I got married and in charge of my own kitchen! yey! Syukur for the opportunity and a husband who gave me that! My own kitchen and...everything else. Thank you! 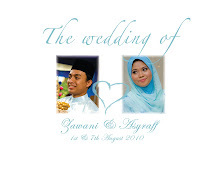 This year, we beraya at our new home:) I really looking forward to it except...for the fact that our house is very small. I keep worrying how on earth we can accomodate the Malaysians here. sigh.. But, all went well, Alhamdulillah. We have so much leftovers lagi. So, A had been having ketupat, rendang, lontong for 3 days in a row. bahahaha xp. I cooked kuah lodeh, fried chicken, nasi lemak, kuah kacang, rendang, lemang and nasi impit. The legendary lemang is here. I don't like it though. The lemang segera brand Nona. But the others loved it! The first to finish! A pat on my back for cooking all of these, all by myself. When I finished, I also can't believe my eyes! We set the buffet table at the kitchen. So, we have more space at the living.